Gigaom's Liz Gannes has written an interesting piece today about Google’s Approach to Social for 2010. Many popular tech writers are very bullish about Facebook in comparison to Google, when it comes to the social web. The belief is that, in the long run, Facebook will beat Google due to the valuable social information it has got about millions of users around the world. Their theory is that Google is only good at the informational web, the one about indexing online info and making it easily accessible. The more lucrative and more valuable social web, they say, belongs to Facebook. Or so the theory goes. Well, there's many a slip between a theory and reality. At first glance, the popular tech writers' theory might appear to be true. Google spends a lot of resources to index all kinds of content on the Internet. Facebook spends a lot of resources to collect information about your friends. When it is time to purchase a product or try a new restaurant or watch a movie, will you give more importance to an anonymous review you discovered through a Google search or the recommendation of a friend you know and trust? Does the information web have more value or the social web? At first glance, Google is the place where you go to search for things. Facebook is the place where you formally identify certain people as your friends, you share your status messages with them, perhaps even some photos and may be invitation to events. And Facebook has been seeing spectacular growth to its user population in recent years and months. So, it's easy to believe that when it comes to all things social, Facebook is "where it's all at". Facebook might know about your occasional mood of the moment through your status message or when a relationship starts / ends. But Google knows about a lot of things that happened in between - from the places you searched to go on your first few dates to the relationship advice you sought via Google. Facebook might know about those itty-bitty messages you write each other on your walls, but Google has your entire emails and transcripts of your chats. Not only with people you formally designate as friends, but also with people you don't label as friends, with colleagues, former / current / prospective employers, with strangers you might have briefly communicated with... just anybody and everybody to whom you sent an email from your GMail account. You might send an invitation to your friends for a day trip from Facebook, but Google knows all about it when each and every one of the trip group looked up directions on Google Maps. If you are a GMail user, I bet your GMail address book is much bigger than your Facebook friends list. Google could use just the address books of all GMail users and easily draw threads connecting the majority of the world's online population. Do you use Google Calendar either on the desktop or via your smartphone? Google knows a lot about the events in your life - big and small - than Facebook ever would know. Are you a Google Voice users? Great! Google knows about the people you call or sms too - whether they are your friends or not. Last I heard, Facebook had no idea about your phone calls. Do you use apps like Google Docs or Google Wave to collaborate with friends and colleagues? Google knows all the details about your collaboration projects. I could list a lot more scenarios where Google has Facebook beat hands down when it comes to information about your social circle and yourself. Google was thinking of online social links when Facebook was still a baccha (Hindi word for child). Remember how GMail was launched? The concept of one person inviting another? It was not just a marketing gimmick. It was a way for Google to find out who knows whom around the world. To build a social map, so to speak. Google was the first email provider to think of listing every single person you correspond with as a contact. On Facebook, there is a certain conscious "social web" action you to do in order to let Facebook learn about you. You know that you are posting something online to share with someone or for someone to see. The beauty of Google's approach is that, you don't have to do anything that explicitly feels like a 'social web' action; all you do is merely go about your life, using online tools which are truly useful. You are not conscious of sharing or posting something somewhere that someone could see. Consequently, you end up sharing a lot more. Google might never build a social networking website that is better than Facebook. It is not necessary. As long as Google knows more about you than Facebook and Google doesn't do evil stuff with that information and Google knows how to monetize that information without doing stupid things like informing your girlfriend about the engagement ring you bought her before you are ready to propose, Google will always be ahead of Facebook. Will the Nexus One work in India? Will the first Google Phone, the Nexus One work in India? The top three bands above are 3G. If you can find a cellular carrier who provides service over those bands, you can use the Nexus One to its full potential. In the US, T-Mobile is the only large GSM carrier who supports the above 3G bands. On AT&T, the other large GSM carrier in the US, Nexus One users will be limited to 2G EDGE speeds. Almost all Indian cellular operators support at least the above 2G EDGE bands. 3G service availability in India is extremely limited right now. Even among the few Indian operators who seem to offer 3G in just one or two Indian cities, I did not find anyone who supports the above 3G bands. If you have differing information, please leave a comment with as much details as possible. Bottomline: If you are in India and you want to use the Nexus One, you are assured of at least EDGE speeds. I don't know how fast EDGE connections are in India. Here in the US, it is as fast as most residential wired Internet connections in India. I can watch Youtube videos on my BlackBerry phone over EDGE network. So, your Nexus One experience in India may not be so bad. 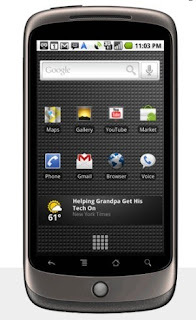 Yesterday, Google unveiled Nexus One, the first phone to be sold by Google through its own web store for mobile phones. This is arguably the best Android phone to date. Yet, fans of Android phones are disappointed. Almost all of Nexus One's features and specs were known before yesterday's official launch by Google. This is hardly surprising, because Google had distributed thousands of these phones to its employees worldwide and to a select group of non-employees (including some bloggers) in December 2009. As nice as the Nexus One seems to be, it represents only an incremental upgrade to both the Android OS and the phone hardware. Going purely by the handset specs, there is no reason for Google to sell this phone as its own. So, people expected that Google might offer some wow-inducing service with the phone. Alas, that was not to be. When Google made big announcements in the past, it was to capture the imagination of the people and turn them into loyal users of its services. This time, Google has a more subtle agenda. Google has entered the phone selling business to break the nexus between mobile handset makers and the cellular service providers in the US. Compared to many other countries in the world, the US has a small number of very big cellular service providers. Each of these carriers provide service over a different wireless band. As a result, most cell phones in the US work with just one carrier, rarely two. Almost all cell phones in the US are sold via carriers, bundled with their service packages. The carriers entice the customers by offering a rebate on the phone if they sign up for a contract. This power that the carriers have over which handsets will be sold to their customers, gives them extreme leverage over handset makers. For example, if a handset maker wants to sell a large number of phones to the customers of Verizon Wireless, he better not include any features in the phone that would displease Verizon. For years, the US carriers have used this leverage to artificially hold back any big advances in cell phone features. Why let handset makers sell feature-rich phones, when the carrier could milk customers for dollars by providing the same feature? Or, why spend too much money in upgrading their networks if customers get handsets with VoIP or video features? Google realized that if it wants mobile phone users to freely access the Internet, Google's own services, and most importantly, the ads it serves, then it should break the strong say that carriers have in dictating phone features to handset manufacturers. Hence, it has setup a web store where people can directly buy feature-rich phones, instead of buying them through carriers. Google's ultimate aim is to offer a range of very attractive phones that are bought by people for their great features, and not for the carrier's network or the rebate the carrier offers. The choice of a carrier becomes secondary in the customer's mobile phone buying process. Especially when Google will start selling phones which will work on multiple carriers' networks. Today, people who want to buy an iPhone in the US have no choice but to sign up for AT&T's service. This is a result of the tight bond between carriers and handset makers. In the brave new world of tomorrow, the phones Google sell will work on any network. So, the carriers have to compete with each other to win the customer's business. They won't get customers simply because they have an exclusive deal with the manufacturer of a popular phone. If Google didn't free the mobile phones and its users from the hold of carriers now, in a few years when mobile ads are a multi-billion dollar business, the carriers will balk at letting Google's ads travel through their networks as freely as those ads travel over the Internet now. Google would be forced to share a large portion of its ad revenues with the carriers who would function as toll-gate attendants over the highways of their networks. Only the toll would be too high. By offering phones that people would want and by making those phones workable on any network, Google is ensuring that carriers cannot hold its ad revenues to ransom in the future. By selling phones itself, Google alone is in control of what features go into those phones. This is Google's ultimate agenda.